Based in the North Shore area of Chicago, Dr Newman offers unique treatments and programs to help patients move better and feel better. 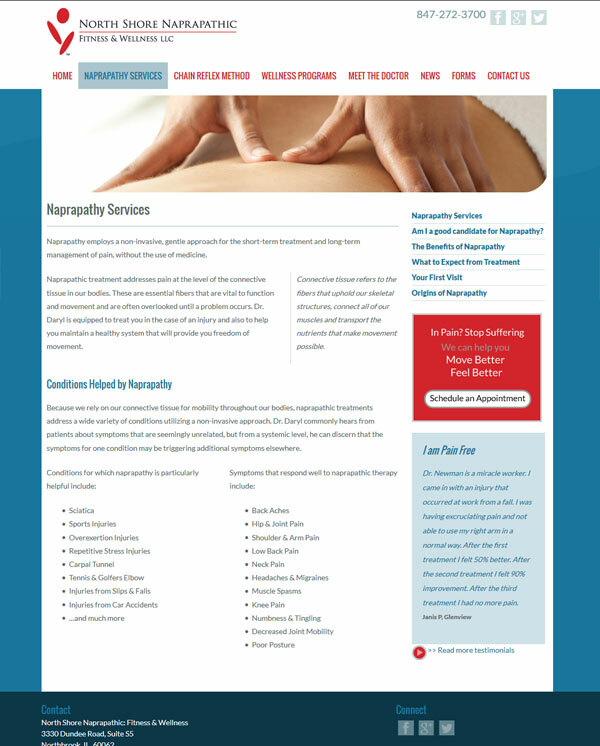 Naprapathy is a non invasive method for treating and managing pain, everything form back aches to carpal tunnel and Dr Newman combines treatment with custom exercises unique to a patient’s problem. He also offers customized fitness training – Chain Reflex, and wellness programs including weight loss, pre and post natal and sports nutrition. Given that most people do not have a clue (me included when I first met Dr Newman) what naprapathy is, we approached the creation of the website based on how treatment could help specific problems. 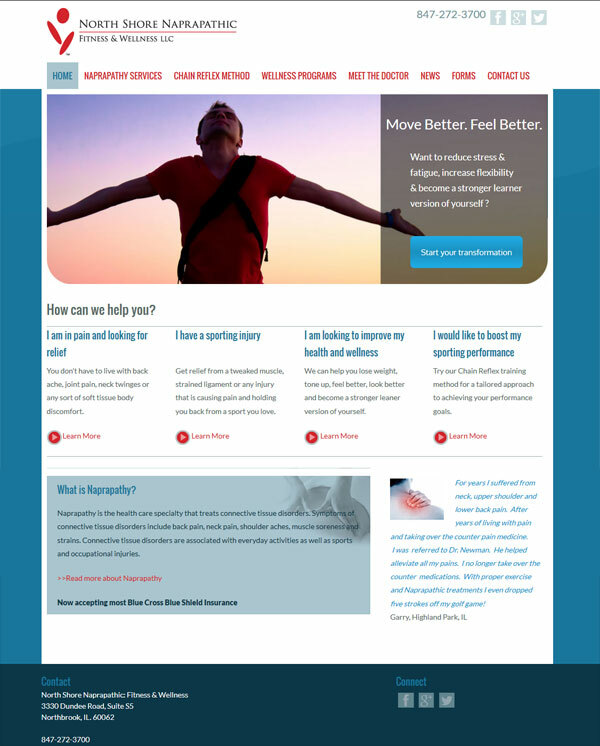 The home page features a slideshow with distinct patient scenarios leading to targeted call to actions. We also included a section titled “How can we help you” with more scenarios such as ” I am in pain and looking for relief”. As the visitor delves deeper into the site a better understanding of what naprapthy is and what to expect are gained. The site is sprinkled with an amazing set of testimonials that speak volumes of the skill Dr Newman offers. The design is clean and uplifting reflecting how patients feel after a treatment session. It is built on the WordPress framework which will allow Dr Newman to easily update, he is also going to be writing a regular blog – a great way to market a site. It is also completely mobile friendly. This entry was posted in Chicago Web Designer, Responsive Web Design, Uncategorized, Web Design Projects, Wordpress. Bookmark the permalink.